Signature Arts, Inc.: Roy Rogers Museum Auction Museum Closed in 2009, Collection sells for $2.9 Million Roy Rogers' stuffed horse Trigger and His Saddle are top sellers! Roy Rogers Museum Auction Museum Closed in 2009, Collection sells for $2.9 Million Roy Rogers' stuffed horse Trigger and His Saddle are top sellers! 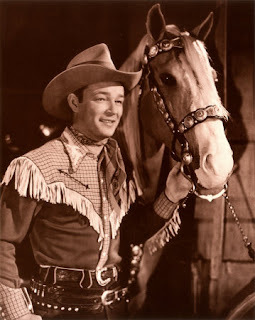 The stuffed horse belonging to cowboy actor and singer Roy Rogers along with his saddle took top dollar at an auction in July for memorabilia from the Roy Rogers and Dale Evans Museum Collection. The Museum closed in December 2009, less than six years after it picked up and moved from its longtime Route 66 home in Victorville, California, to Branson, Missouri. Christie's auction house, which ran the sale along with Western auctioneer High Noon Americana, said the collection of items related to Rogers' and wife Dale Evan's roles on television and in the movies brought in $2.9 million. Other top sellers included Roy Rogers' 1963 Pontiac Bonneville and the Nellybelle jeep, an iconic emblem on the Roy Rogers Show, which ran on television in the 1950s and 1960s. Dale, Gabby, and Pat sold for $3,750. Bullet sold for $35,000 (est. 10-15K). He was their real pet. Dale's parade saddle, estimated to sell between 20-30K, sold for $104,500. It's no wonder Trigger fetched over $266,000 at the auction. He was a genuine Hollywood star. Roy and Trigger made 188 movies together. The horse began it's "career" in show biz in the 1930s. Do you remember the 1938 movie The Adventures of Robin Hood with Errol Flynn and Olivia de Havilland? Well Olivia rode Trigger in that movie. Trigger was bred on a farm co-owned by Bing Crosby. Roy bought Trigger on a time payment plan for $2,500. Trigger even out did Bob Hope by winning a P.A.T.S.Y. award (animal equivalent of the Oscar) for the movie Son of Paleface, in 1953.